Yesterday we received a photo of another Green Box in the Melbourne metro area. This o­ne is trying to hide between some well known street furniture. It is also located outside a Milk Bar. The proprietor was asked what she thought the Green Box was and was surprised that she had not considered its use before. Now that it had been brought it to her attention she did find its presence rather curious. She said that a woman came o­nce a day to take something out of it as there is a locked door o­n the back of it.A recent quick exploration of some of the outer suburbs of Sydney as unable to locate any such similar boxes. Is this purely a Melbourne phenomenon? Any Xenoids (Xenophobes?) 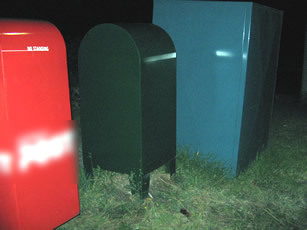 in other states are urged to report o­n the presence or absence of similar green boxes.